As a staunch libertarian, it’s pretty rare for me to come across someone who is more libertarian than I. By “more libertarian”, I mean that they believe in even less government than I do. Perhaps that’s why I was oddly excited, intrigued and energized when I first heard libertarian/anarcho-capitalist, Stefan Molyneux from Freedomain Radio as a guest host on the Peter Schiff radio show. To back up a bit, most people are shocked when I tell them I think the federal government should be about 5-10% the size it is today. At a time when Democrats and Republicans in Congress can’t seem to find areas to even slow the growth of the budget, I would lop off 90-95% of federal spending if I were in charge. If we returned to the government laid out by the Constitution, I argue, the tiny federal government would provide national defense, (the kind that defends U.S. soil from invading armies, but does not police the world and embark on wars of aggression and empire) it would have a small court system to prosecute a few federal crimes like treason, ensure free trade among the states, and deliver the mail (although, nowadays they shouldn’t be doing that either). Then the tiny state governments could fill in the gaps by protecting property rights, enforcing contracts, and prosecuting violent crime. Since nearly everyone wants more government than I do, I’ve heard all of the arguments from that side of the ledger. They’ll argue, “But of course we need the government to… (insert government program here). Don’t you want… (roads, clean air, education, a safety net, people not to become drug addicts, poor people not to die in the streets)” Well, of course I do; I just believe that there are better ways of achieving those ends than through a state controlled monopoly that uses force and coercion as its means. It occurred to me that while I understand that government is violence, that government is inefficient, and that government distorts and stifles the economy, I still just accepted that we needed the government for some things like national defense, police, and court system to protect us from violent crime and fraud. Just as the big government person probably hasn’t spent any time considering how the poor might be taken care of if the federal government didn’t do it, I hadn’t given more than a passing thought as to whether or not the state was the only way to handle national defense or law making. My rationale for these beliefs, which seemed self-evident, was that we needed some level of government to protect us from violence and fraud, and that the writers of the Constitution did a pretty good job of drawing the line between a government that protects us without encroaching on our basic freedoms. In short, as a nation, we voluntarily agreed to relinquish a tiny and precisely defined bit of freedom to elected officials in exchange for a functioning society. If we could just get back to that strictly limited government of the Constitution, 99% of our problems in society and in the economy would be improved or disappear completely. By now you may have visions floating around your head of teenage hooligans with black bandanas across their faces throwing bricks through windows, or African warlords driving around in Jeeps smoking weed, blaring music and shooting at people for fun. At least that’s the vision I used to get when I thought of Anarchism. But what the anarcho-capitalists are presenting is something entirely more civilized. There are still rules, contracts, property rights and societal norms for moral behavior, only they would be enforced by private entities in the market that people interact with voluntarily rather than government agents who are granted a legal monopoly on the use of force. I realize it’s a hard topic for most people to wrap their head around. Heck, I’m a longtime libertarian (not sure how I missed Rothbard’s views on this) and the idea of a completely stateless society is a mind bender for me. At first, the whole idea raises more questions than it answers. Who writes the laws? Would we even have laws? How do you enforce them? What if someone invades us? In the absence of a government wouldn’t some warlord or dictator just rise up and grab power? But the more one learns, the more one opens up to the possibilities of how society might function in the absence of a formal state. If your curiosity has been piqued, the clip below is an introduction to how a stateless society might function, by Stefan Molyneux. It’s almost a half hour and requires some concentration so I’d recommend listening when you have some quiet time. If you are interested in learning more, I’d recommend checking out the Freedomain Radio podcast. Mr. Molyneux is extremely smart, and well versed in philosophy, psychology and world history. His podcasts are entertaining, challenging, compelling, quirky, and above all, genuine. I learn something new every time. A few words of caution: He tends to ramble a bit (ok a lot) and often doesn’t provide supporting facts mainly because he’s mostly concerned with morality and logic and also because for many of the podcasts he’s doing it while driving home from work. He is rigid in his morality and ruthless in his condemnation of religion, war and military people, and abusive parents (his definition of abusive parents is pretty broad) so if you are sensitive about these topics consider yourself warned. Also, there are over 1000 podcasts so you will want to be selective. Perhaps select the category:anarchism on the right side of the page to find the podcasts on this topic. This entry was posted in Community, Politics and tagged anarcho-capitalism, anarchy, libertarianism, murray rothbard, stefan molyneux. Bookmark the permalink. 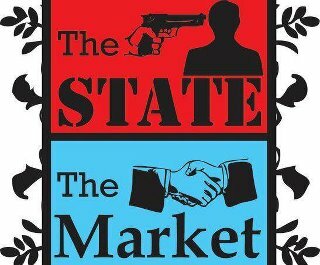 If you want the original version of the State vs. Market picture I would be happy to send it your way. Cheers! Did you make that picture or is there another version that came first? In any case it would be great if you could send it to mike@libertyinsight.com and I will include a link to the original site on the picture. As a model for how government might work without coercion, take a look at the Woodlands, Tx, which has almost 100,000 people living and working together in a city with neighborhoods, parks, lakes, a business district, and industrial district, but with no government (until 2010 when they were effectively forced to adopt one). The same model could be used for any type of city, with the addition of security and justice. The rules are adopted by contract with the landowners. I think it would require quite a zealot to say that a constitution sized (one can argue the current administration is constitution sized, since everything a government does is legal) minimal government is just as bad as the system we have now. An objective anarchist would state that a minimal government is philosophically inconsistent, but from a zero-sum perspective, I’d be hard pressed to find somebody to say that less tyranny is just as bad as more tyranny, simply because there’s ‘some’ tyranny. Furthermore anarchists argue that things would be ‘better’ absent government, but not *always* the case. What I mean is that overall, things will be better, but you can always take particular moments and go ‘aha! this is worse than governments!’ Of course, what are statistic but particular moments? I find this line of argument is best solved by appealing to theory regarding what precisely statistics are, which gets into ideas like trends and other technical issues. Aiee…. I really wish anarchists and libertarians could be friends. The basis behind their philosophies are very similar, and since the current system is not libertarian, it doesn’t hurt to have a first step as a truly libertarian USA, then see where we go from there. That’s been my view as well. Libertarians are on the right track. Republicans want to drive the knife deeper and twist it to the right. Democrats want to drive the knife deeper and twist it to the left. Libertarians want to pull the knife *almost* all the way out because they think having a knife sticking out of the body is perfectly normal but it shouldn’t be *too* deep because that subjective level is just plain wrong. If we are able to achieve their goal, I’ll bet most of of them would conclude that life without a knife stabbed into you would be even better. The argument against a constitution-sized government is that if we, as libertarians in general, are correct that free-markets will lead to increased prosperity, then the growth of the constitution-sized government is inevitable as the parasites grow to consume a portion of all of the wealth that is growing in society. As they continue to grow, we end up with the bloat we have today, which explains how a constitution-sized government ended up in this situation in the first place. To have a lasting freedom, complete abolition of the state is required. We could also remove aggression from the state, and keep it as an organizing force for society; one which could be used to set minimum standards for justice, establish standards by which property could be homesteaded, such as land, water, fishing rights, airspace, and satellite orbits, etc. It would simply be a voluntary organization dedicated to ensuring justice and the protection of property. Been listening to S Molyneux for a few years now and can’t find anything to oppose his arguments for no state. … Really though, ever person who believes in “government” tends to do so because they have pet projects – one, or multiple, that they think are justified enough to violate a moral code that most of us understand inherently. When someone argues that the “government” should oversee something… they won’t admit it to themselves, but they’re arguing on behalf of violence. Take any law or regulation you believe is unjust (weed, taxes, not signing up for the draft, not vaccinating your kid, buying raw milk… on a SUNDAY! ), civilly disobey it and follow the state’s reaction to its logical conclusion … First comes threats, then theft of your property, then kidnapping of you or another (at which point you probably experience physical violence), then imprisonment (where you will probably experience slavery), and.. if you resist enough, death. These are the only tools the state has, force and theft … yet these are the things we beg the state to protect us from … it is unacceptable. For an Anarcho-Capitalist it is about rejecting, out of hand, solutions- that are ineffective anyway!, that betray the ends. Theft to control theft, violence to control violence, that sort of thing… there are infinite possible solutions for the problems we face that Don’t simply replicate the problem in a “validated” or “consented to” way … and we’ll only discover those when we stop trying to centrally control resources- time, money, brainpower… through “government.” We’ll only discover the best or most desired solutions when we let people free to discover them. On a side note, Molyneux mines a lot of economists and philosophers for his ideas but doesn’t bother to mention them in case his viewers would be interested in further reading. Check out AnCapChase on youtube- he is great at explaining these ideas and cites his sources so you can read deeper. Here is Molyneux laying out his argument for why minarchy is a bad idea. This is only 5:35 long, but he sums it up pretty well.